In this week’s blog, I want to talk about go-kart speed. Something of which is always an ongoing battle with racers, track owners, and insurance companies. 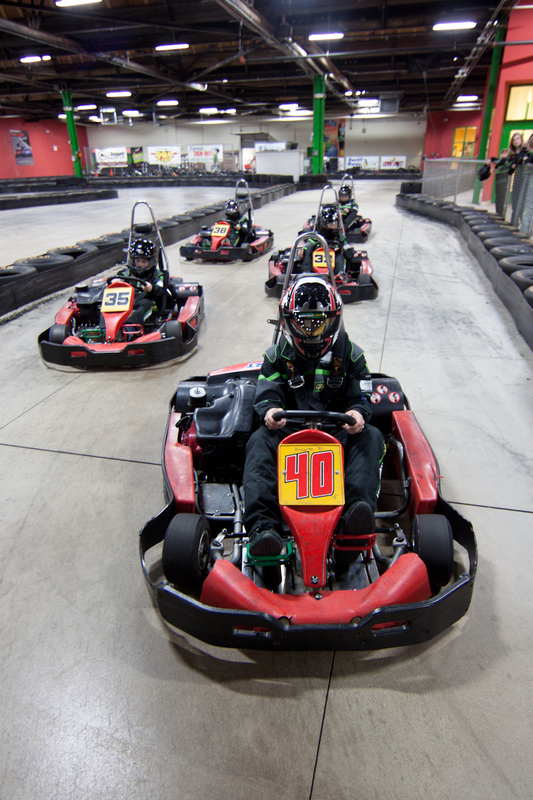 Most karts max out around 40-50mph, while this is a maintained speed that is safe and as controlled as you can be. It’s a speed that is comfortable in the sense of you wont fly off the track, and hurt other racers or patrons. At LVGP ours max out at around 45mph. Street legal go-karts are a rarity to see, because the laws that require them to be deemed “safe” are meticulous. Costing thousands and a bunch of red tape. However, if you were to have a street legal kart you may have that speed considerably higher than what it would need for the indoor track. At LVGP our track is designed to reach max speed (45mph) for a only a few seconds before having to decelerate to make an easy turn. If not, you hit your turn too fast and spin out, or will be pulled to the outside wall (centrifugal force). The world’s fastest go-kart is primarily not on a windy course, but down straight-a-ways, with minimal degree turns. The world’s fastest go-kart is called the Daymak C5 Blast go-kart. Canadian made, this go-kart speed reach 0-60 in 1.5 seconds. Yes, you read that right, 1.5 seconds. Your next question is, “How is that possible?” Well its because they gutted out the engine, for all electric, lighter parts. Making it weight and aerodynamically efficient. Although that may sound cool, one of these bod boys will cost you a smooth $60,000. Team Daymak is on the verge of creating some of the coolest kart features and products. I was hoping to get one for the track! Just kidding…… maybe. Fast karts are cool, but in my opinion if you get the feeling of going fast, and can maneuver effectively for quality racing, then the speed is a secondary feature. Regardless, who doesn’t love to go fast, get the inside lane on someone, and pull away down the straight-a-away?!? This is what LVGP gets excited about and loves to bring to the table for their amazing customer base. The experience is what we want to create as authentic as possible for our patrons. With that being said, we want everyone to always remain safe no matter how fast you’re going. Wear a helmet, obey cautionary flags, and always respect the staff and equipment.